Repeated, extended deployments in support of OEF/OIF/OND have important implications for not only veterans, but also their family members. While this topic is beginning to garner more attention, more research is needed on the relationship between symptoms of posttraumatic stress disorder (PTSD), parenting factors, and family functioning among OEF/OIF/OND veterans. 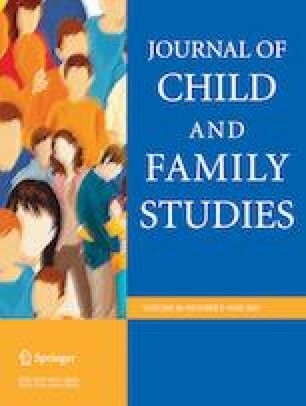 The present study aimed to: (1) examine the relationship between specific PTSD symptom clusters and family functioning among a sample of N = 191 treatment-seeking veteran parents who served after September 11, 2001; and (2) examine the mediating role of parenting sense of competence in this relationship. Participants completed the PTSD Check List (PCL), the Parenting Sense of Competence Scale (PSOC), and the Family Assessment Device (FAD) as part of their initial evaluation in an outpatient mental health clinic. Numbing and avoidance symptoms of PTSD (Criterion C; PCL_c) were associated with more problematic family functioning (r = .164, p < .05). There was a strong negative relationship between parenting competence and problematic family functioning (r = −.514, p < .001). Examination of the indirect effect of PSOC on the association between PCL_c and FAD based on 4000 bootstrapped samples revealed a significant indirect effect (point estimate = 0.0092; BCa CI = 0.0035, 0.0170), suggesting that decreased parenting sense of competence might mediate the relationship between numbing/avoidance symptoms and problematic family functioning. Future studies confirming the central role of parenting in the relationship between PTSD symptoms and family functioning are warranted. The authors acknowledge philanthropic support from Wounded Warrior Project; Welcome Back Veterans, an initiative of Major League Baseball and the McCormick Foundation; and many other generous supporters of Home Base. L.M.L. : designed the study, analyzed the data, and wrote the paper. A.M.B. : collaborated in the writing and editing of the final manuscript. E.M.G. : collaborated in the writing and editing of the final manuscript. B.Y.O. : collaborated in the writing and editing of the final manuscript. N.M.S. : consulted on study design and collaborated in the writing and editing of the final manuscript. E.B. : collaborated in study design, data analysis, and writing of the manuscript. Ms. Laifer, Ms. Blackburn, Dr. Goetter, and Dr. Ohye have nothing to disclose. Dr. Bui receives royalties on a textbook for Springer Nature and has received grant/research support from NIH, PCORI, and DOD. Dr. Simon has received grant/research support from AFSP, DoD, NIH, Janssen, PCORI, and Highland Street Foundation. She has served as a consultant for the MGH Psychiatry Academy, Aptinyx, Springworks, Praxis Therapeutics, and Axovant, and her spouse has equity in G1 Therapeutics. All procedures performed in studies involving human participants were in accordance with the ethical standards of the Massachusetts General Hospital (Partners Healthcare) Istitutional Review Board and with the 1964 Helsinki declaration and its later amendments or comparable ethical standards. De-identified data were maintained in a database repository approved by the Massachusetts General Hospital (Partners Healthcare) Institutional Review Board. All data collection procedures have been IRB-approved. As patients completed measures as part of their clinical evaluation and care in an outpatient clinic, informed consent was not required. Kulka, R. A., Schlenger, W. E., Fairbank, J. A., Hough, R. L., Jordan, B. K., Marmar, C. R., & Weiss, D. S. (1988). Contractual report of findings from the National Vietnam Veterans’ Readjustment Study: Volume 1. Research Triangle Park, NC: Research Triangle Institute. https://www.ptsd.va.gov/professional/articles/article-pdf/nvvrs_vol1.pdf. Monson, C. M., Fredman, S. J., & Dekel, R. (2010). Posttraumatic stress disorder in an interpersonal context. In J. G. Beck (Ed.) Interpersonal Processes in the Anxiety Disorders: Implications for Understanding Psychopathology and Treatment. (pp. 179–208). Washington, D.C.: American Psychological Association. https://doi.org/10.1037/12084-000. National Center for Veterans Analysis and Statistics. (2017). Profile of post-9/11 veterans: 2015. Department of Veterans Affairs. https://www.va.gov/vetdata/docs/SpecialReports/Post_911_Veterans_Profile_2015.pdf.